Woody Paul gave an obviously stunned and delighted Old Crow Medicine Show‘s Ketch Secor a fiddle Roy Acuff had given Woody when he was 16. With that, Woody called Ketch to the mic and said “It’s a birthday party, and I want to give you a present,” and handed the fiddle to Ketch. The audience, witnessing a teeny tiny bit of history, audibly gasped. 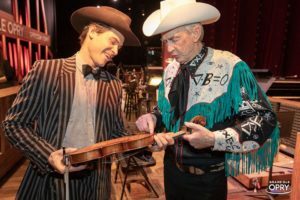 “Ketch is one of the greatest old time fiddlers I’ve ever heard, and I’m glad he’s part of our Opry family carrying on the old time traditions,” said Woody. “Such a great moment,” observed Too Slim. “Nice job Woodrow,” said Joey, the Certified Accordion Player.